The apartment “Golfo degli Angeli” is a location not far from the city centre, in a semi-detached house with garden near by the sea. The wonderful Poetto beach, one of the most beautiful beaches near the city of Cagliari, is only 900 mt. from the B&B and the bus stop to the city centre is 100 mt. from the house. The apartment is on the ground floor of the house with its independent entrance (on the first and second floors lives the owner). 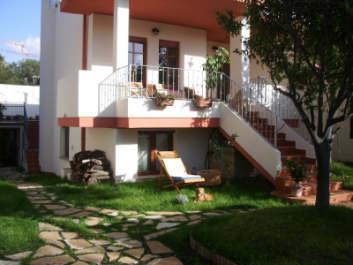 The house is an excellent starting-point to reach the city centre in 15 minutes by car , the most beautiful beaches of south-east coast (Villasimius, Solanas, Costa Rei) e south-west coast (Chia, Tuarredda, Teulada), the archaeological site of Nora, the Giara Park and the nuraghe of Barumini. -a new golf club , some riding-grounds, tennis courts, the aquatic park “Diverland” and a lot of restaurants, pizzerie, supermarkets and ice-cream shops. 2 double bedrooms, restored in 2007, are situated at the ground floor of the house; you can see the garden throw the windows. • tourist information on restaurants, pizzerias, bars, places to visit and so on.